Shaneaka Price is the salon owner of Beautiful Textures Hair Salon dba/ Coastal Virginia Hair Replacement Center. 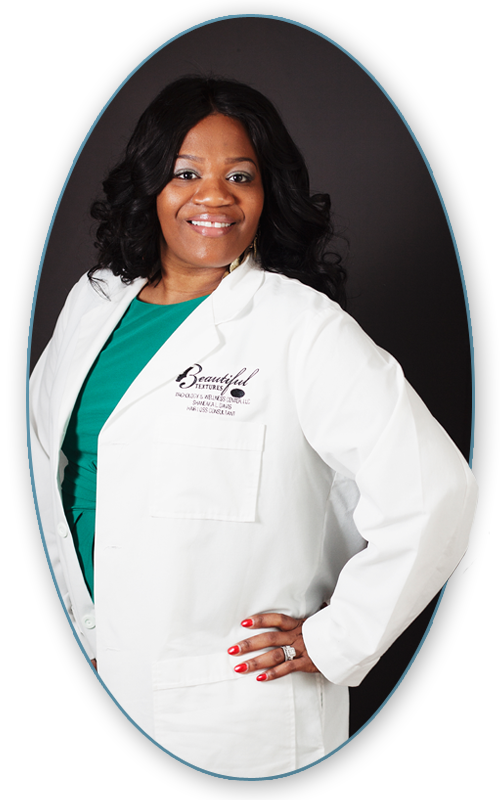 She is a Senior Stylist, Licensed Cosmetology Instructor, as well as a qualified hair loss practitioner. She’s been passionate about the hair industry all of her life. To better serve her clients and to remain at the forefront of her field, Shaneaka frequently participates in workshops and educational Symposium giving by some of the top leading product manufactures in the country, such as Paul Mitchell, Design Essentials, Influance, Mizani, Wella, Liquid Keratin, Keratin Complex and Xtreme Lashes. She has also trained with celebrity stylist like Marcella Ellis, Evie Johnson and Dionne James Eggleston, Toni Love and On Rite. She has also trained with some of the world’s leading lash technicians such as Loreta Jasilionyte & Stefani Altieri; where she received a dual certification in Russian Volume, which is an enhancement service she provides for clients who have experienced damage to their lashes from medical treatments. Shaneaka places great value on listening to her clients, understanding their needs and respecting their hair. She has mastered a wide range of hair techniques, including cutting and coloring, texture services and she strives for unlimited creativity. With over 15 years of training and experience, Shaneaka is equipped to cater to men, women, and children of all nationalities. After 14 years of service, Shaneaka noticed an increased number of clients were suffering from hair loss and began to take an interest to find a solution. She experimented with various treatments to no avail, but continued to be passionate to find answers for her clients. While tirelessly looking for treatment options; she stumbled upon the field of Trichology in May 2010. In March of 2014, she became a Qualified Hair Practitioner through the International Association of Trichologists (IAT) and has been trained on subjects such as common hair loss problems (causes and treatments), and the structures, functions, and physiology of the hair and skin. Shaneaka is soaring in the beauty industry and creating transformational experiences for all those who step through the doors of Beautiful Textures Hair Salon. Clients aren’t simply visiting her salon, they are being elevated and inspired to feel and look their best! Remember… It’s All About You!! !